Following a long-awaited loan guarantee approval from the United States Department of Housing and Urban Development (HUD), construction will soon begin on The Moderne. The $55.2 million tower, which will stand at the southwest corner of Old World Third Street and Juneau Avenue, will contain 203 apartments, 14 condominiums, 204 structured parking spaces (181 apartments, 23 condos), and 7,230 square-feet of first-floor retail. The City of Milwaukee had previously approved $9.3 million in loans to finance the project, but they were conditional on the approval of a loan guarantee by HUD. The guarantee was expected to be approved in February, but an overwhelming number of applications received by HUD forced an approval slowdown. To gain approval from the Common Council for a loan from the city, developer Rick Barrett (no relation to the Mayor) agreed to increased levels of Business Enterprises (EBE) program participation (25%) and Residential Preferred Preference (RPP) program participation (30%), and a first-lien personal guarantee of $4.35 million. The majority of the project is being financed by a $41.4 million loan from Capmark Financial Group Inc and the AFL-CIO Housing Investment Trust. The Moderne does not fall within the footprint of the former Park East Freeway, but does fall within the tax-incremental financing district setup after freeway demolition (TID 48). Apartment rents are projected to be $1.94 per square foot in 2013. 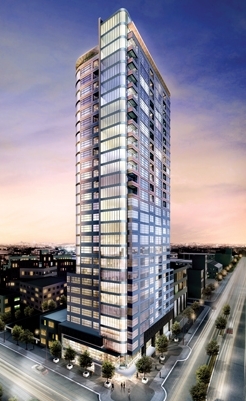 Average planned sale price for the condos is projected at $939,000. Leasing for the retail space is projected to bring in around $22 per square feet. The Moderne, designed by Rinka Chung Architecture, tower will stand tall over its surroundings at 30-stories, dwarfing the nearby Bradley Center, Aloft Hotel, and Full-screen 4th and Highland Garage. Eventually, the development may not stand alone as the remaining Milwaukee County-owned Park East parcels are developed. I’m no expert in architectural renderings or perspective… but is it supposed to look anywhere from 5 to 10 times taller than any other building in the scene? Oh yeah… 30-stories tall? Sheesh…. @Pete Oh yeah The Moderne is quite a bit taller. While a tall building is a good idea at this site, I’m not a big fan of the design. It’s not compelling. It pays no homage to the beautiful old architecture of Milwaukee, but at the same time does not make a strong modernist statement. It’s neither. I’m glad it’s being built. I just wish it was more inspired. I’m sorry my references are always to Minneapolis but that’s where I spent 10 yrs before moving here. As a rule I much prefer the old buildings of downtown Milwaukee to the steel and glass of modern buildings. But one modern design I’ve always loved in Mpls is the 5th St Towers (http://www.glasssteelandstone.com/BuildingDetail/1954.php). I call them “Mother and Daughter”. These buildings don’t have that typical feel of most modern glass towers where the architect just “hit the repeat button” for 10, 20 or 30 stories. Anyway, I’m glad it’s funded and moving forward. Great idea – build a new “super tower” while the surrounding neighborhoods are swamped with overcapacity in empty, underwater or in-foreclosure properties that will take years to clear out. I predict this construction project will eventually stall, much like the nearby Staybridge project – the only difference being the additional amount of taxpayer money wasted on this particular initiative. And why does the city feel the need to subsidize high-end luxury condos and apartments in the first place? If this project was such a great idea, the developer should have been able to raise sufficient financing on their own. @Concerned… if you ask me, taxpayers should ONLY subsidize high-end buildings. I’d rather help build something of value that’s going to be good 50-100 years later that a low rent dump that’s a blight on the city the moment it was completed. What’s more the increase in tax base from a successful luxury condo far out weighs the tax subsidy. That’s the plan at least. Haha, “super tower”,that’s funny… let me know if one is ever proposed in Milwaukee. I’m glad to see this project move forward, this should really set the tone for the whole area. Also, this is nothing like the Staybridge, that project is stalled because the developer stole from the investors, not because there wasn’t demand for the building. I know many people on this site realize this, but so many out there don’t realize the potential this project has as a “catalyst”. With the continual development of The Brewery only 3 blocks away and (hopefully) the development of the tower that will house the Marcus theatre another 2/3 blocks away, this area is really getting a shot of energy it needs. Even if the “Marcus” office tower doesn’t happen, the influx of 300-500 people in the area will be really beneficial. There actually is no taxpayer subsidy for this project. The loan the city is providing is above market rate. The developer was willing to pay that because no banks were giving any loans out last year, even above market rate. MilwaukeeD: That is just brilliant. So the City of Milwaukee thinks they are somehow a smarter lender than all those banks out there who, having taken a serious look at the risks on this project, decided not to touch it with a ten-foot-pole? And if the loan doesn’t get repaid? I’m calling a spade a spade – loans and loan guarantees (insurance) ARE a subsidy (City and Federal/HUD). And yes, this is a “super tower”, not by Chicago standards but certainly compared to the 3-4 story buildings nearby. Well good luck with this project and good luck finding tenants for these apartments and the $939K condos – maybe we can squeeze in some $16.80/hr “casual” Harley employees with a “minor” discount, once the project has moved through the foreclosure process. Hey CT, where are you exactly a taxpayer of… West Allis? I’m not joking, do you have a horse in this race or are you just trolling around? I’m a resident of Milwaukee living a little over a mile from the Moderne build site. My “horse in this race” is what I see all around me – a housing market dominated by foreclosures and falling rents, friends and acquaintances trapped in severely underwater mortgages on their condos unable to refinance, a neighbor who is being evicted from bank owned rental property because the city is finally foreclosing for 3-years past due taxes that the bank refused to pay, a nearby 8 unit apartment building that is vacant and just went on the market for $200k etc… I could go on. It is obvious to me that until problems such as these are addressed and the Milwaukee property market stabilizes, the last thing we need is even more large-scale (pie-in-the-sky) construction. The result of this construction will be to drive down existing property values putting resident home owners even further underwater. What we should instead be focused on is repairing and making use of existing structures to house Milwaukee families near downtown at a reasonable cost of living, affordable at the median salary Milwaukee residents can earn. Construction to just “increase the tax base” or “create more (very temporary) jobs” or provide housing for the “elite” who can afford $900k+ condos does little or nothing to address the needs of the majority of residents in this city. As such, it seems like a gross misuse of any taxpayer funding/backing. Additionally, the projected sales price and rents for this new project are just that, projections – there is no certainty that residents will actually be found for the Moderne that are able and willing to pay those prices/rents in this depressed market. While your goals of preventing property value decline and providing homes are admirable, I just don’t think they’re relevant. These are about 200 units in a housing market of more than 650,000 households. Even then, these units won’t be available for about 2 years, in the mean time this project will be providing jobs to help everyday people work and keep their homes, to have the income to buy a property or rent an apartment. Now, as to your ideas about repairing existing structures… yes there are foreclosures in every neighborhood, city, suburb, and rural area. However, this is not representative of ‘normal’ just as the last few years of the 00’s were not. I don’t see the will or the ability for the city to start a lending program like this to renovate foreclosed homes, especially when many are in neighborhoods that no one would prefer to live in.